I think you misunderstood him....he doesn't want to WRITE a tutorial, but he doesn't mind us using it for a tutorial. Since your instructions for creating a font don't intersect with D'Lanor's instructions for the journal, I don't see the conflict. My opinion is that you're in the clear. andylegate wrote: Oh, but that brings up a slight point of contention that D'Lanor has. We need a "Journal" tutorial in the Wiki first I would think. But he doesn't want his Template added to the Wiki due to a disagreement he has about the Fork. Well, time has healed those wounds. I have even added a fix to the GoW SVN so I it would be rather inconsistent to keep this up now. I still wish the fork had not happened. And when it happened I wish it had been handled differently. But such is life. We learn and move on. As Boblishman pointed out, we really ought to wait until you're done with your latest version of the Template. 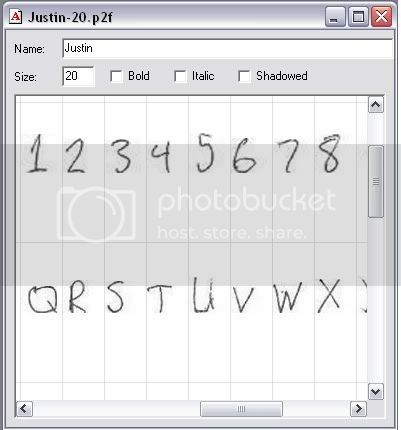 Then I'll be willing to write up a tutorial on the Font Maker, no problems. I'd also be willing to do the tutorial on using your Template if neither you, nor Boblishman have the time. I just finished my RAD Age, and will be taking a break for about a week in Age Building. But that will leave time for me to do the tutorials too. As long as it does not upset you or cause you grief D'Lanor. I respect other peoples views and feelings, and get horrified if I've found I've stepped on someone's toes! I really do respect your feelings about the Fork, and part of me agrees with you on the part that it should have been handled differently. But at the same time, I'm totally ignorant of the history between the people involved. I was off in my own little world while it was going on during that time, and so feel I have no right to judge anything like that, other than giving general observations on how people are acting NOW. In anycase, I just wanted to make sure I didn't have you come hunting me down is all! There is no spoon, Neo... but there was a fork! What ever happened to adding this to the wiki? I dare not close my original window for my font, for fear the ugly version is the one that's saved, therefore all my work would be a waste. Does anyone know what might've caused this? "... (and I originally set it as size 18). " ... ? Well, I saved it as size 18 originally (the .bmp file was the same size as the "Sam-18.bmp" file, but as you can see, the font turned weird after I saved and re-opened it. 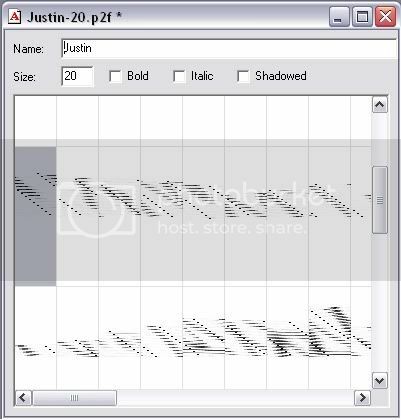 I then wondered if it would fix it if I changed the font size to 20, so I typed 20 as the size, and re-named it "Justin-20.p2f". This did nothing. I had kept the original "Justin-18.p2f", so the change wasn't permanent. Over the past few days I've become pretty knowledgeable about P2F files. I'll throw that out so if people have questions I'm happy to answer them.